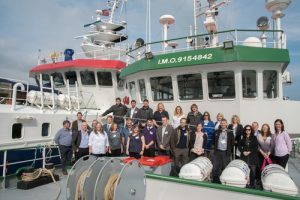 Researchers, industry representatives and commercial producers from both sides of the Irish Sea congregated in Bangor University on Tuesday to officially launch the BlueFish Project, a collaboration between Wales and Ireland that will examine the effect of climate change on fish and shellfish sustainability in the Irish Sea. 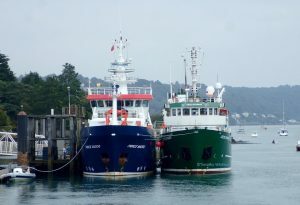 Research ships from Bangor University (RV Prince Madog) and The Marine Insitute (RV Celtic Voyager) moored up alongside each other on St Georges pier. The oportunity to view both ships from the deck of the RV Celtic Voyager was taken, before the two ships sailed to conduct a seven day co operative research cruise.